For centuries, folks around the world have been using oregano oil for the many medicinal and well-being benefits it delivers. Originally it was these health uses people were interested in; the idea of adding it to their cooking pots to add flavour and taste came much later. See the bottom of the page or click on the Thumbnail Images for much more info on the oil and its benefits; plus info on the plant, some facts on the history and if you want the freshest leaves for your cooking, tips on how to grow this herb. 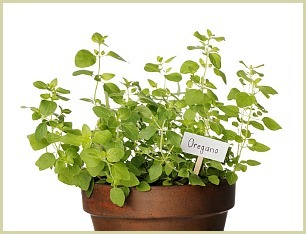 Essential oil of oregano contains the natural active ingredient carvacrol which has strong anti-inflammatory, anti-microbial and antiseptic properties and is readily available in capsules, tablets or as a liquid. It's extracted from the leaves of the flowering oregano plant (Origanum vulgare), and the best oils contain anywhere from 70 to 80 per cent carvacrol. The Assyrians were using this herb as early as 3000BC! Hippocrates, the ancient Greek physician, was using it to treat breathing problems and stomach issues. Today it's used for multiple conditions from sore gums to skin infections to improving joint flexibility to a preventative cure when you feel the first signs of a sore throat arise. The plant itself is actually a member of the mint family and originally came from the mountainsides of Greece, Spain, Italy and other warm Mediterranean countries.